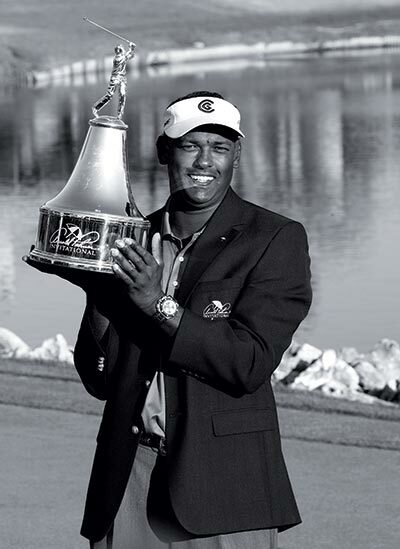 Vijay Singh had amassed most of the big prizes in golf but up until 2007 there was a gaping hole in his trophy cabinet. He first entered Arnold Palmer’s tournament at Bay Hill in 1993, and his record in the event was beginning to look like one of golf’s biggest hard-luck stories. On his first appearance in the tournament, when he was given a special invitation by Palmer, he finished second, a couple of shots behind Ben Crenshaw, and bogeys on the last two holes cost him his chance a year later. Eleven years on from those twin disappointments, the giant Fijian found water with a seven-iron at the last and ended up finishing two shots behind Kenny Perry. So by the time he pitched up to Orlando, Florida for another tilt at the title in March 2007, his failure to capture Arnie’s tournament was beginning to grate. That time, though, there was no mistake and Singh could even afford three bogeys down the closing stretch before claiming a two-shot win over Rocco Mediate. Mr. Palmer presented Singh with the trophy beside the 18th green and observed that “it has been a long time coming” before saying that he knew 20 years beforehand that Singh would one day get his hands on the trophy. Singh, who has had more than his fair share of adventures up the last at Bay Hill, added: “Each time before when I was in contention I either needed a par to get in the playoff or bogey, and I messed up every time. It was a great feeling, but I still hate that [18th] hole.” The win finally put Singh on the honors board which features the name of Tiger Woods, four times in a row from 2000, as well as those of Phil Mickelson and Ernie Els. 2008 marked the 30th anniversary of Mr. Palmer’s involvement, but in fact the event started life as the Florida Citrus Open in 1966, when it was played at Orlando’s Rio Pinar Country Club. Palmer won the title there in 1971, and after 13 years at that venue Palmer made it known that he would be interested in moving the tournament and taking charge of it. Palmer and some business associates took a controlling interest in the Bay Hill Club in 1970 and in 1976 he bought the Bay Hill Club & Lodge outright. Bob Byman’s win in 1979 marked the start of Palmer’s involvement and the tournament was raised to elite invitational status in 1984. The late Payne Stewart put his name on the winners’ roster in 1987 when he carded a tournament-record 62 en route to a devastating four-round total of 264. After Tom Kite’s win in 1989, Palmer put his prowess as a designer to good use when he revamped all of Bay Hill’s 18 greens, increased the yardage and upped the par from 71 to 72. More occasional tinkering since stretched it to a length of 7,267 yards. The new greens did not make any difference the following year to the Las Vegas-born Robert Gamez who took the putter out of the equation on the 18th when holing a seven-iron for an eagle two at the last to win from Greg Norman. Since then Fred Couples won by nine in 1992, Ben Crenshaw won, virtually in the dark, a year later and in 2000 Woods began his four-year dominance of the event which ended with a staggering 11-shot win in 2003. He did not have such a happy time in 2007, when he finished with a 76—his worst score in a regular PGA Tour event for four years. 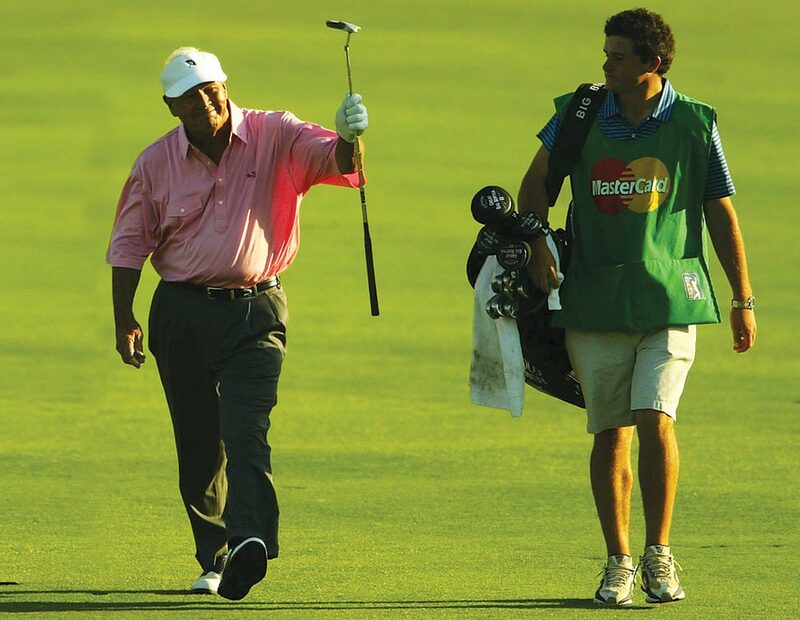 2004 saw the last playing appearance of Mr Palmer in his own tournament, a tournament that he strangely never won. However, Arnie bowed out in typical ‘go for it’ Palmer style; after using his driver off the tee, he then used the self same club for his second shot, which finished on the front of the water protected green to send the packed galleries into raptures. Visitors to Bay Hill may find the course to be more of a challenge than it is to the likes of Palmer and Woods. For the average handicap golfer it is a daunting task, but a memorable experience even if you can’t shoot a Stewart-like 62. The tee shot from the 1st gives an indication of what lies in wait with bunkers waiting to trap any drive that goes off the straight and narrow. There is little respite from there on in, and it is imperative that approach shots are played off the cut grass. Mr. Palmer wanted to make this course a genuine test of golfing ability, and he has certainly made it that. Bay Hill’s best, however, lurks at the last, hence Singh’s remarks about the 18th. But it is without question one of the great finishing holes in the United States. A drive down the left side of the fairway, followed by a mid- to long-iron second over the lake on to the green, means you are alive. But anything over or left of the putting surface is in deep trouble.